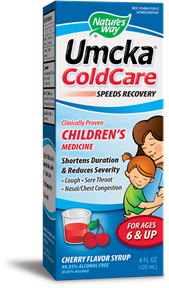 Children's cherry flavor syrup, for ages 6 and up, natural medicine shortens duration & reduces severity of cough, sore throat, nasal & chest congestion, sinus & bronchial infections. 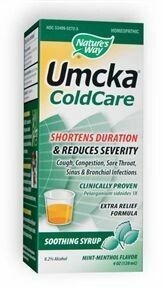 While most other over the counter medicines simply suppress the symptoms of colds & flu, Umcka ColdCare works hard to speed up the recovery time. 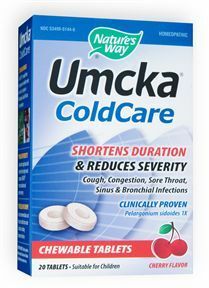 Umcka ColdCare is clinically proven to shorten duration of illness. Natural medicine made from Pelargonium sidoides, a medicinal plant of South African origin. Pelargonium has anti-infective properties by preventing bacteria to adhere to the cells, helping fight viruses and stimulate the immune system. 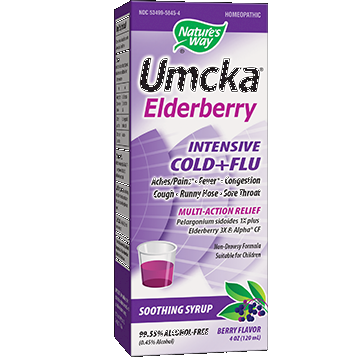 Suggested Use: For best results, use at first sign of symptoms and continue to use for an additional 48 hours after symptoms cease. Children 12 years of age and older: Take 1.5 teaspoons (7.5ml) three times daily.